Welcome to the second podcast that’s dropping on day 10 of our coverage of the Edinburgh Film Festival. I’m joined by Anthony Bynre, the co-writer and director of a new thriller, called 'In Darkness'. Anthony Byrne co-wrote this script with his partner and lead actor, Natalie Dormer. Lee's first joined by Anthony and then we have some red carpet interviews with Natalie Dormer and again by Anthony. 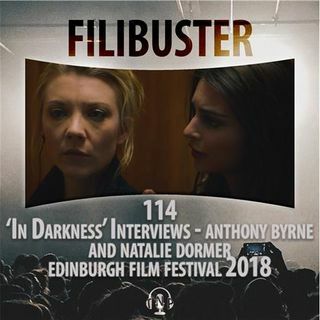 'In Darkness' sees Dormer plays Sofia, a blind musician drawn into ... See More London’s criminal underbelly when her neighbour Veronique dies in the apartment upstairs. Initially, police believe it is suicide, but Veronique, the daughter of an alleged war criminal, knew she was in trouble. Caught between the police and criminals, Sofia must try to survive.